Don’t let anyone dissuade you from eating eggs – glorious eggs – lots of eggs – piles of eggs – loads of eggs (I love eggs as you might guess). They are one of the most nutritional foods on the planet, and please – no egg-white omelettes! Taking out the yolk is sacrilege! You’re then interfering with a whole food. Eat those scrummy yolks! Here are some of the reasons you won’t want to discard those golden yolks. It’s a very powerful source of lutein, which keeps both your eyes and heart in good health – yes your HEART – don’t listen to those who say eggs adversely affect the heart – it’s all porkies! Eggs are heart-healthy – eat lots of them. 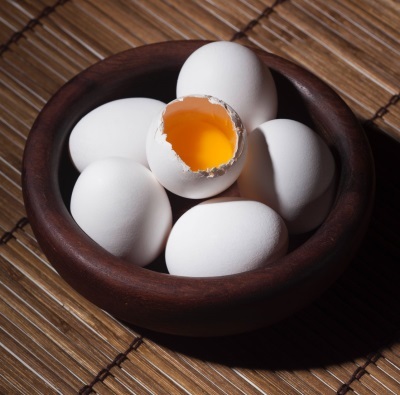 Eggs are one of the very few foods containing vitamin D3, something almost everyone is short of today. Eggs, butter, bacon and collagen coffee …. imagine a world without them? No, I can’t… I just can’t! Ok, I’m off to make myself a big bowl of scrambled eggs, WITH the yolks and a cuppa organic espresso with 2 giant heaped tablespoons of collagen (which you can get from my online store here).